Three and a half years will be credited to Manning’s sentence for time served. This will include time for the period that the judge ruled he was mistreated at the Marine Corps Brig at Quantico, Va., before being moved to the prison at Fort Leavenworth, Kansas. Throughout his time at Quantico, he was designated a “maximum custody” detainee and locked up alone for at least 23 hours a day. He was forced to sleep naked for several nights and required to stand at attention naked in the morning. He will have to serve one-third of the sentence before he is eligible for parole. It was reported recently that the NSA has no idea what or how much information Edward Snowden has in his possession. Clearly, the United States and Britain are terrified about what information might be revealed next concerning their war machines and surveillance networks. Manning downloaded the leaked material to his computer when he was deployed as an intelligence analyst in Iraq in 2010. What did he actually reveal? The most widely seen information was seen in the “Collateral Murder” video, which showed an Apache helicopter attack on a group of people walking in a Baghdad street in 2007. Two of the victims were employees of Reuters news agency. A member of the helicopter crew yelled “dead bastards!” at those they killed. They also blew up a van of civilians who had stopped to help the initial victims of the first round of gunfire. The “Reykjavik-13 Cable” was the first leak to be published by WikiLeaks; it describes frank discussions of meetings between the U.S. embassy chief in Reykjavik and members of the Icelandic government. The scornful attitude of the U.S. representative towards their nation in the middle of its banking crisis so angered activists in Iceland that they edited the “Collateral Murder” video, which was soon released worldwide. The “Iraq War Logs” were 75,000 Army documents that detailed U.S. nighttime raids with reports from U.S. troops on the ground. These reports have been used to track civilian casualties that officials previously had said were not available. The leaks also showed the hypocrisy of the U.S. collaboration with Arab dictators while proclaiming a commitment to democracy. 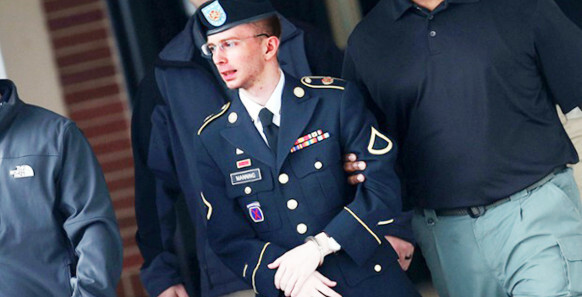 The Bradley Manning Support Network will continue to keep the spotlight on Manning. They have organized international support through education and activism about his case as well as raising $1.4 million for his defense. Even as the sentence was handed down, the network announced that they were teaming with Amnesty International to launch a petition asking President Obama for a pardon. At the same time, Manning’s attorney, David Coombs, is preparing to bring the case to the Army Court of Criminal Appeals to address violations of due process rights. Manning was detained without trial for more than three years in violation of his Constitutional right to a speedy trial. He was only awarded four months off of his sentence for the psychological torture he suffered while in solitary confinement for more than nine months. The U.S. Marine Corps was never held accountable for Manning’s treatment. Also, President Obama declared Manning guilty in April 2011, more than two years before the trial began. This constitutes unlawful command influence, in violation of the Uniform Code of Military Justice. The Center For Constitutional Rights has made clear that all of the supporters of Bradley Manning must continue to struggle for his freedom and raise the demand that President Obama issue a pardon for Manning. [Update: Aug. 23] This article was written immediately after the sentencing, on Aug. 21. The next day, Manning provided a statement to the press, “As I transition into this next phase of my life, I want everyone to know the real me. I am Chelsea Manning. I am a female. Given the way that I feel, and have felt since childhood, I want to begin hormone therapy as soon as possible.” In future articles, Socialist Action will respect Chelsea Manning’s wishes, and refer to her using female pronouns.